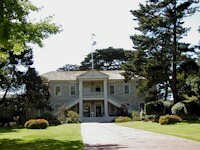 The California State Constitution was drafted here from September 1 to October 15, 1849. Reverend Walter Colton erected the building as a public hall and school house. He and Robert Semple established California's first American newspaper in Monterey on August 15, 1846.